Public garbage cans are provided at parks, trails and bus stops as a courtesy to park and transit users to keep these areas free of litter. It is illegal to dump or deposit any household, business, construction or garden waste in any park, including any municipal receptacle. Household garbage and junk illegally dumped in public garbage cans and District parks may attract animals and create an unsightly mess. 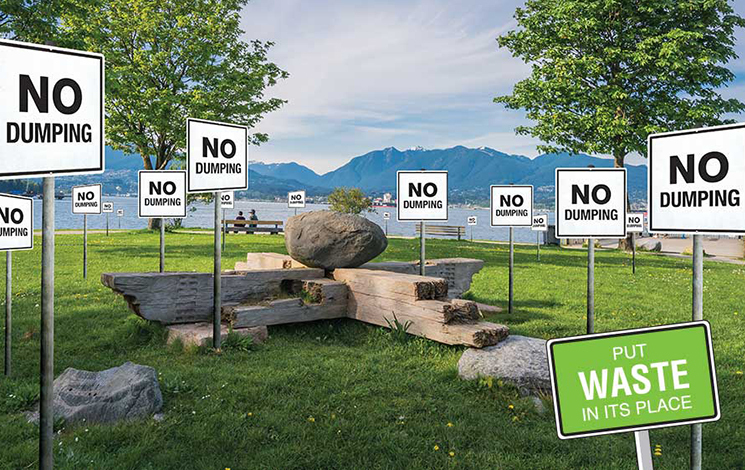 Litter, excess garbage and illegal dumping result in higher costs to keep West Vancouver clean. It also sends the message that illegal activity is acceptable in your neighbourhood. Please do your part to dispose of all waste responsibly through curbside collection or at a licensed disposal facility. The maximum penalty for illegal dumping in BC is $10,000. Consider what’s in your extra household garbage and check if these materials could be recycled in the Blue Box or Green Can, collected weekly. Use the Green Can to recycle food scraps and food soiled paper and reduce your garbage by up to 40%. Learn more here. Blue Box recycling expanded to include even more materials in 2014. Learn more here. Still have extra garbage on collection day? Buy extra garbage tags at Municipal Hall or Gleneagles and West Vancouver Community Centres. Tags are $6 for each extra 77 L bag or can, and they don’t expire.